Sorry folks, you get what you pay for. Period. We get called upon all the time to “advertise” using offers such as Groupon, Living Social, Deal of the Day, and more. There’s a reason why mature, bonafide businesses know to steer clear of these terrible business-killers. First of all, it’s pitched as a form of “advertising”. It’s really not advertising. Effective advertising results in a customer. A customer is someone who pays for my service, and creates a profit. A Groupon forces the business to paid 75% off of what they normally get paid (a $100 cleaning must be sold for $50, then Groupon splits the commission, leaving only $25 for the owner–well below the break-even point to redeem that Groupon!). Most of us don’t mark up our product or service so much that we can actually work for 75% off. That’s just not possible in the service industry. We can discount sometimes by 10% off a first time service, with the hope that the customer will fall in love and sign up for ongoing service,–but who can work for 75% of what you charge? No legitimate maid service can, (except maybe the ones that employ illegal workers, who cannot be screened for security and safety). Don’t think for a minute this couldn’t happen to YOU, the consumer! Groupon is a business-killer, therefore it’s not good for consumers either. 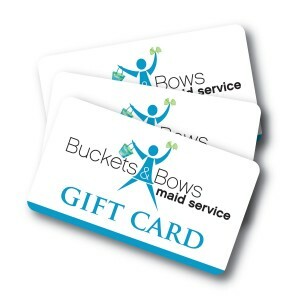 At Buckets & Bows Maid Service, we thrive on repeat business. It’s what helps to keep our prices down. The more customers we have that use us every week to every other week, the more competitive we can be with our pricing. This also enables us to offer fair and competitive pricing for the one-time cleans as well, as not everyone can afford to have service a couple times a month. “Deals” like Groupon wreck good businesses who have tight margins. The only time a Groupon is good for the business is if their mark ups are 300% above break-even. This is just not likely in so many businesses. I do a lot of business consulting with maid service business owners around the globe. Everyone that has called on me for help, after they signed up for a Groupon deal, has regretted their decision and prayed for the day when the offer expires! Unless your margins are crazy, crazy high, stay away from Groupon type offers if you’re a business!